Richard Hughes is a first generation dairy farmer. It’s not something you often hear, most Sonoma County dairy farmers are several generations in. But Hughes had a dream when he was only 14 years old, and it was to become a dairy farmer. At the time, Hughes lived in the Bay Area, but spent a summer in Nebraska milking cows by hand. After coming back, his 4-H sheep project turned into two Guernseys he purchased from his 4-H leader. While in the Bay Area, Hughes lived two doors down from Marilyn, the woman who would become his wife of more than 55 years. 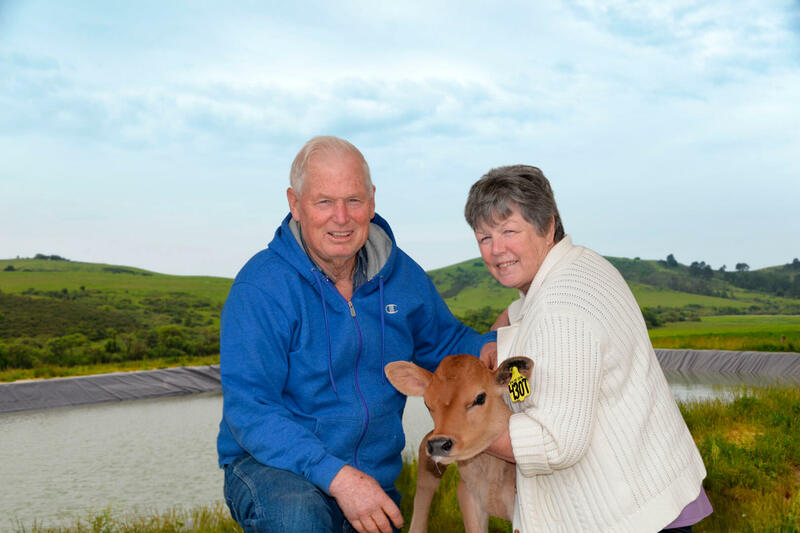 Marilyn has helped her husband achieve his dream of being a dairy farmer, and, today, the couple is still married with two children, four grandchildren and four great grandchildren. Decades later, Hughes has become more than just a dairy farmer. With 182 acres and almost 220 cows, he’s a very successful one and a leader in the Sonoma County dairy industry. Hughes is committed to bettering his dairy through both the care of his animals and his land management. 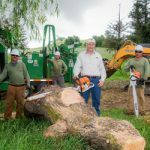 His dedication to the environment has earned him Sonoma County Farm Bureau’s Luther Burbank Conservation Award. Hughes will be honored at Farm Bureau’s Love of the Land event on July 15 at Richard’s Grove and Saralee’s Vineyard. Alongside Hughes the Mauritson Family will be awarded Farm Bureau’s Farm Family of the Year and Tim Tesconi who will be inducted into the Farm Bureau Hall of Fame. Hughes was humbled by the award, saying there are many other deserving businesses who have received the award in the past. Marilyn said while they are proud to be receiving the award, it’s not something they have worked towards or planned on. Hughes’ parents moved to Petaluma in 1961, bringing their children’s 4-H projects to their 25 acre parcel. Richard and Marilyn moved to Petaluma in 1964, at first living in the suburbs. They bought out his parents in 1974 and purchased their current property on Bodega Highway two years later. The family recently sold the original 25 acres. Until 12 years ago, Hughes was raising Holsteins. With his Holstein herd, he had far reached the goals he had as a 14 year old. His dairy was successful and his cows were top producers. So when Marilyn asked her husband to look into Jersey cattle, Hughes saw it as a new opportunity. A representative from the Jersey Association heard he might be interested in Jerseys and called to ask if he would be interested in looking at a herd which was downsizing. Hughes agreed on the condition he would be looking at high quality cattle. He went to look at the herd, not knowing what he would do, but at the end of the day, he brought home 27 new cows. “By the third milking, we knew we would sell the Holstein herd and the Jerseys would come in,” said Hughes. In 2004, they sold all their Holsteins and Hughes purchased almost 200 cows from the same herd. Hughes had nearly 300 head at one point, but said he walked outside with Marilyn one morning and asked her if she could feel what he felt. Both agreed they could feel there were too many cows on their property. They sold off 60-65 head, for a more manageable size herd. Ideally, Hughes would like to have one cow per acre on his property, although he is still above that number. In 2005, Hughes was approached by Albert Straus (who purchases the Hughes Dairy’s milk for Straus Family Creamery) and was asked to switch to organic. In June 2006, the Hughes Dairy became organic. Hughes said going organic was like going back to school again. He found old books from the 1930’s and 40’s on animal management. Hughes compared the way organic cattle are managed now to how all cattle were managed three quarters of a century ago. “It’s been a whole new learning curve,” Hughes said, “and there was a whole other side to going organic which was learning how to manage the land. Managing the land and plants is a whole new part, bigger than I did before. For Hughes, the biggest change in land management has been going from deep plowing to “essentially no-till”. Hughes admitted none of his practices are set in stone; he’s always trying something new to be a better caretaker of his land. 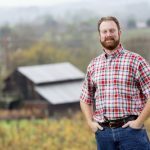 Hughes said the biggest difference between his switch from conventional to organic is instead of bringing the food to the cows, he now brings the cows to the food. He has 70 acres sectioned off for his milk cows, but this is split into 18 smaller fields around two to three acres each. His milking cows are on an intense rotation schedule and moved every 2-3 milkings, almost every day. Around mid-April, Hughes has to start clipping his fields for weed control. He grows predominantly rye grass, but uses different varieties to grow grass for a longer time of the year. Instead of seeding in rows like a traditional seeder does, Hughes is figuring out how to evenly spread seed throughout the fields. Currently, Hughes is aerating his fields, just like golf courses do. He says his practices have gone from deep plowing to barely touching the top of the soil. Alongside Hughes’ work with his pastures, one of his biggest projects has been working on water conservation. Hughes, who has lived on his property 40 years, has only seen the local Salmon Creek go dry four times. One of those times was last year, and Hughes was concerned. He had been diverting more than 7,000 gallons of water per day. Which means for six months, Hughes needs 1.2 million gallons to keep his dairy operational. To combat this, Hughes has worked with Gold Ridge RCD and NRCS to build a roof rainwater catchment pond. The roof of his dairy barn was lined with pipes which collect rain water that runs down into pipes underneath his barn and into the pond. The pond, which is 200 feet long, 80 feet wide and 19 feet deep holds 1.7 million gallons of water, more than Hughes needs, and should be enough for his operation until November. Hughes jokes that the lined pond is the largest lap pool in Sonoma County. Over the summer, Hughes plans to try plastic hexagon covers to prevent evaporation and help keep the water cool. In addition to providing water for the dairy, the pond will protect the natural fish habitat and reduce strain on Salmon Creek. Hughes has endless ideas for conservation and how to be a better steward of his land. While he is unsure of the property’s future and doesn’t expect his children or grandchildren to take it over, Hughes still strives to leave the property in better shape for the next generation.